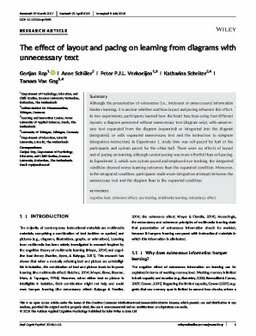 Although the presentation of extraneous (i.e., irrelevant or unnecessary) information hinders learning, it is unclear whether and how layout and pacing influence this effect. In two experiments, participants learned how the heart functions using four different layouts: a diagram presented without unnecessary text (diagram only), with unnecessary text separated from the diagram (separated) or integrated into the diagram (integrated), or with separated unnecessary text and the instruction to integrate (integration instruction). In Experiment 1, study time was self‐paced for half of the participants and system paced for the other half. There were no effects of layout and of pacing on learning, although system pacing was more effortful than self‐pacing. In Experiment 2, which was system paced and employed eye tracking, the integrated condition showed worse learning outcomes than the separated condition. Moreover, in the integrated condition, participants made more integration attempts between the unnecessary text and the diagram than in the separated condition.